GMD’s primary product is our branded Marine Kits®. Our Marine Kits are globally recognised and provide an efficient and effective way to build vessels. We combine professional design knowledge with on-water practical experience to deliver advanced vessels, designed for export anywhere in the world. Each Kit is comprised of the hull and superstructure structural aluminium package, with the option of windows and doors to ‘lock-up’ stage. In its simplest form, our boat kits include the complete aluminium to build the hull and superstructure, already pre-cut, marked and packed in a flat pack ready for transport. This allows the builder to begin assembly from the day the kit arrives. As opposed to the conventional method of boat building which requires ‘lofting’ (drawing the frames out full size on the loft floor), the time and cost savings begin immediately. There are no decisions required on the workshop floor as to how best utilize the available material as in ‘conventional’ boat building. The components have already been ‘nested’, onto plate material making optimum usage of the material. The largest time savings are in the pre-cut frames and stringers. Yes!! the hull stringers are all pre-cut to drop straight into the stringer notches in the frames. The vessels are then constructed and delivered in a country of choice. Export of the kit is made possible with the vessels’ pre-cut flat pack (complete knock down) form resulting in efficient transport. This innovative concept led to the creation of Marine Kits driving the success of exports. We sell flat packed kits and ensure the certification of the aluminium materials by arranging the cutting of the kits ourselves. Along with the quality of router cutting and kitset packing, we guarantee the kit’s precision, consistency and accuracy, providing a better outcome irrespective of where our vessels are built. Marine Kits® is a registered trademark of Global Marine Design. Marine Kits are very comprehensive, use only marine grade materials and are designed to exceed the requirements of the major design codes, therefore the cost has to be considered with regard to these features. Experience has shown areas of the vessel structure which require extra special attention and re-enforcement, and all of the Marine Kits® products address these issues. Also, most of our Marine Kits hulls are bigger than any comparable kits on the market. If you dare to compare, you will find that our hulls have both more freeboard and wider beam for a given length of boat, and heavier material content. These are high volume hulls, designed to perform at sea, cruise at good speeds, whilst carrying an acceptable payload. However, the real saving is that you can put together your own team and assemble your new vessel in your chosen location, often utilizing reduced labour costs. Combine this with the fact that the pre-kitting of the structure and components has proven to save around 30% of the time to build the same boat by conventional methods. The expected cost saving on the aluminium construction alone is approximately 150 hours per tonne of material assembled for vessels over 10m. 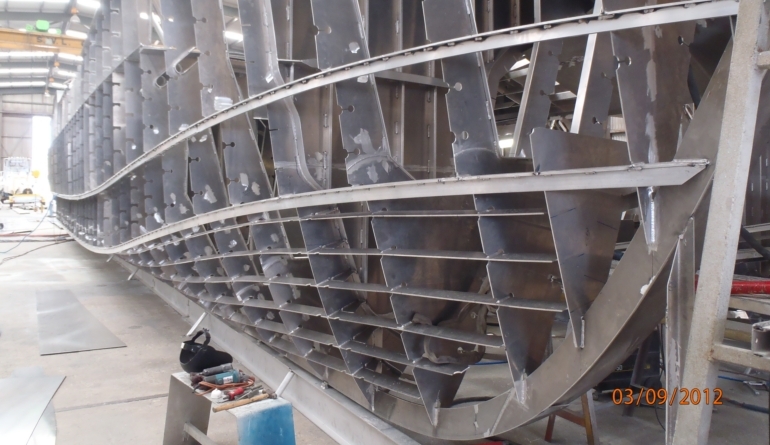 As an example, on a 20 metre monohull, this translates to a labour saving of around 1500 hours for the metal work component. vessel lifting lugs and inserts (if agreed upon during quotation). We have 70 components on our design system kitset checklist and 53 items on our kitset extrusions checklist. For every vessel that we produce in kitset form, we cross check all components to ensure that you have a comprehensive package. Where available we also supply a CD of photos of the same or similar hull from start to finish so that you have your ‘virtual builder’ at your side during construction. Please note that we supply a materials list for all items in the package, complete with our designer’s material take-off. To note, on average, we supply 20% more than is required from our extrusion take-offs. For in excess of five years, since introducing this system, we have not had a single claim for extra material. • The owner is supplied with a bound set of the vessel drawings. Can I Purchase the Cut File? 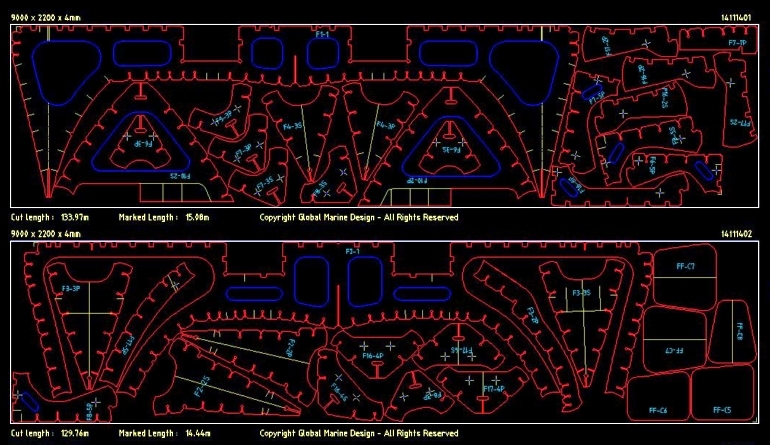 We at Global Marine Design, strive for a high standard of product and have particular operational reasons why we do not readily on-sell the cutting files. Our kits are cut at select, dedicated aluminium cutting facilities in Western Australia and the UK. 1. All of our aluminium kits are cut on a dedicated, all-aluminium cutting bed. This is essential to avoid contamination from iron oxides, which occurs when cutting facilities cut both steel and aluminium on the same cutting bed. These contaminants, if not removed, become included in the weld, resulting in porous welds with inclusions. These welds would NOT pass survey x-ray an will be subject to accelerated corrosion. 2. All reference marking is done by spirit based pen. Our marking is an important and integral part of our kit production for both labels and alignment marks. Other lesser machines use powder marking which is very easily rubbed off during fabrication. Powder marking is also most often done using the oxy-acetylene head and therefore adds a high level of heat into the aluminum plates, just to make marks!!. The heat can cause distortion of the plates. 3. Prior to cutting and marking, the machine is calibrated over the full length of the largest plate, requiring the cutting and/or marking head to return to within 2mm of its origin. The maximum error we allow is less than 0.02%, essentially 2 millimetres over a 9 metre sheet. 4. Our plates are lifted onto the cutting bed using non-marking suction clamps. They are removed after cutting, with non-marring lifting clamps. This means our plates have absolutely minimal scratches and/or marks caused by handling. 5. Cutting is executed at the correct speeds in accordance with the corresponding plate thickness. We have witnessed first hand, lesser facilities that cut fast to maximize their profits, as well as running their consumables too long to minimize costs. The resulting product has low quality cut edges requiring increased labour by the builder, to bring the edges up to a suitable finish prior to welding. 6. Our cutting facility has over 6 years of dedicated aluminium kit cutting experience. 7. Due to the close proximity of our cutting facility to the technical design office, we are able to inspect all cutting jobs prior to dispatch. This is also an integral part of our quality assurance procedures. 8. We cut ONLY using DNV certified plates, of alloy 5083, MARINE GRADE ONLY. By supplying the complete cut kit, we ensure the correct material is used in our packages. The buyer is supplied with the material certificates as part of the kit documentation. 9. Our kits are nested on optimal plate sizes. Locations and/or countries outside of Australia generally have different plate sizes. Our Marine Kits packages, we believe, are the highest quality aluminium kits produced anywhere in the world, incorporating a high level of intellectual property, technology and research and development. We have implemented a constant program of innovation and improvement and therefore protect our kit packages by controlling the issue and packaging of the technology. Only under exceptional circumstances for multiple kitsets will we consider a licensing arrangement whereby a purchaser can cut our Marine Kits at their nominated cutting facility, from our files. 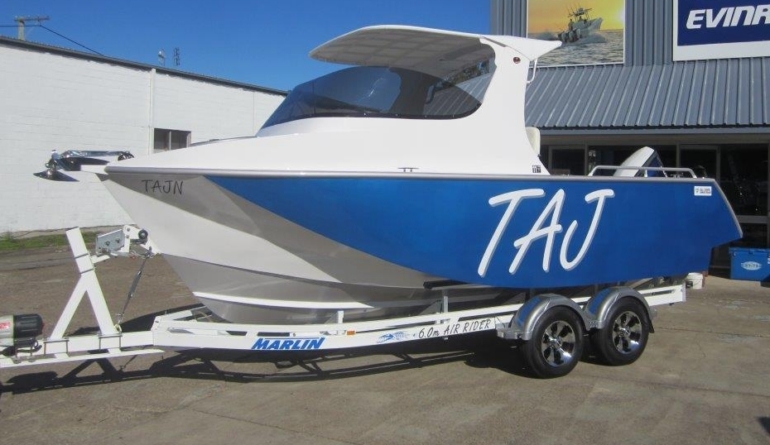 This is subject to a stringent range of checks by Global Marine Design Pty Ltd, to ensure finish, tolerance, quality of product and record of boats cut. All costs for GMD to visit the site are to be borne by the purchaser. If a licensing agreement is established, the solicitors for GMD will draw up the binding agreement and all costs will be borne by the purchaser. 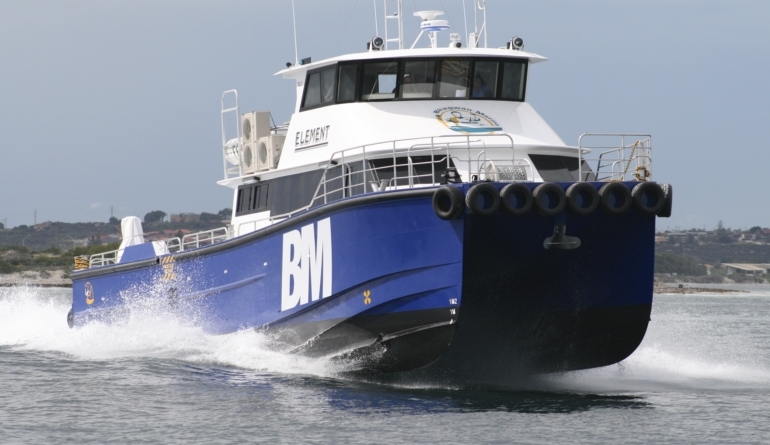 For a multiple build license agreement, GMD insists that the first two vessels are cut at their facilities in Western Australia, to ensure kit quality and component checking. 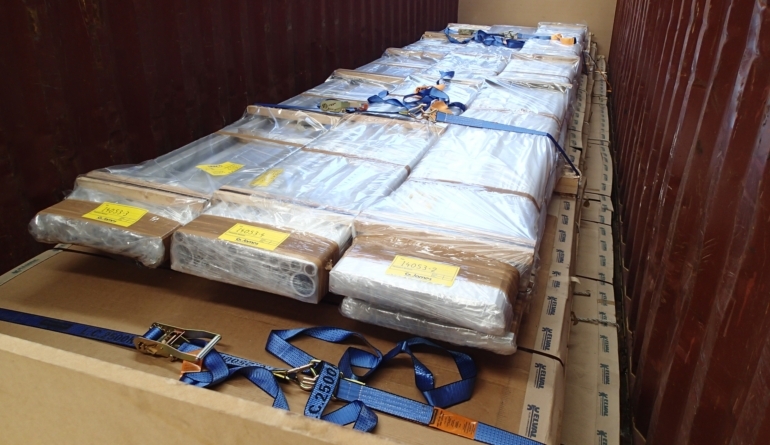 In closing, some purchasers feel that we are making large profits on the aluminium and also that the transport costs prohibit the viability of buying Marine Kits from us. The belief is that by licensing to cut at their own premises, they will increase their savings. This is not the case as GMD only have a small fee on the material to cover ordering, inspection, handling and quality control. Additionally, transport is relatively cheap worldwide EVEN FOR ONE KIT. Our policy is to send kits F.C.L. (Full Container Load), which means the purchaser, is paying for a whole container. The advantage is that your Marine Kits package is not loaded in with other goods, possibly for different destinations. If you order more than one kit, then the shipping cost becomes an even smaller portion of the project. Consider this simplicity and time saving for you, after all, isn’t that why you are buying our Marine Kits packages? Can I Purchase a Finished Vessel? Global Marine Design can supply your Marine Kit as a flat pack, or as a fully assembled aluminium hull and superstructure ready for painting and fit-out. We can even arrange for painting and deck coverings, all you have to do is ask. Some of our smaller vessels have flat pack and assembled kit prices listed in our catalogue. For all other vessels the pricing is POA, as we’ll need some more info from you first. Please call us on 08 9437 1319 or click CONTACT at the top of the page for more information. 1. Unless we otherwise agree in writing, Marine Kits packages are sold upon the following terms and conditions. 2. Payment of the deposit on a Marine Kits package will constitute acceptance of these Conditions of Sale. 3. You are supplied the Marine Kits package for the construction of ONE (1) vessel only. You must not use the Marine Kits package design, data and drawings for the construction of a second or subsequent vessel. 4. The Marine Kits package is protected by copyright, including Australian copyright law, international treaty provisions and the relevant laws in the country where it is used. 5. You must not copy or reproduce (either in whole or in part) the design, data, drawings or the aluminium pre-cut templates of the Marine Kits package. 6. The Marine Kits package contains information which is confidential. You (which includes your employees, agents or sub-contractors) must not disclose our confidential information and you must take all reasonable precautions to keep our confidential information safe and secure. 7. The Marine Kits package design, data and drawings are supplied to you as a service to support the construction of the Marine Kits package vessel. The Marine Kits package design, data and drawings are not salable or tradable goods. You must not sell or otherwise dispose of the Marine Kits package design, data and drawings other than by return to us. 8. You must not copy (whether by copying onto any other material or reproducing by any other means) the aluminium pre-cut templates for any purpose whatsoever. 9. You must not modify the Marine Kits package design, data, drawings and the aluminium pre-cut templates, without our prior written consent. Unauthorised modification may result in loss of performance or defects in the vessel produced. 10. If you wish to make modification to the Marine Kits package, you must ask us to make those modifications. If we modify the Marine Kits package we may charge a fee. 12. You must tell us if you engage (or intend to engage) someone else (“your Builder”) to build the Marine Kits package vessel. 13. You must provide us with your Builder’s details. (b) provide us with a true copy of your Builder’s written acknowledgment. 15. Only when we confirm receipt of your Builder’s written acknowledgment of the Conditions of Sale can you deliver the Marine Kits package, or any part of it, to your Builder. 16. You are responsible for your Builder’s performance and for your Builder’s compliance with these Conditions of Sale. 17. You are liable to us for any loss or damage we suffer as a result of your Builder’s breach of these Conditions of Sale. 18. You will indemnify us against any claim, action or demand for loss or damage arising from or as a result of, our supply of the Marine Kits package to you, except to the extent of that the loss or damage is caused by our negligence. 19. You must pay a deposit of 30% of the purchase price of the Marine Kits package when you place an order. 20. You must pay us either by direct bank transfer or by bank cheque and you must pay any applicable bank charges. 21. You must pay the balance of the purchase price when the Marine Kits package is ready for despatch to you. 22. The purchase price includes all costs, including insurance costs, associated with transport and delivery to your nominated destination address. 23. The Marine Kits package is ready for despatch to you when we receive a letter confirming it is ready from our cutting facility. 24. You must inspect the Marine Kits package immediately it is delivered to your nominated destination address and you must notify us immediately of any damage. 25. Except as provided for in these Conditions of Sale, we accept no liability for damage or loss suffered by you once the Marine Kits package is delivered to your nominated destination address. 26. In case of a dispute in relation to these Conditions of Sale, you agree to submit to the jurisdiction of the Courts of Western Australia and Australia. 27. These Conditions of Sale are governed by the laws of Australia and the State of Western Australia.